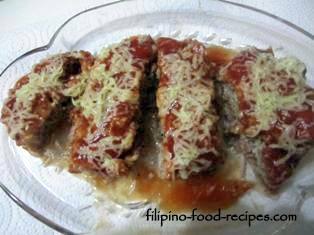 This steamed meatloaf recipe is my mother's creation, which she calls "Pasingaw", or steamed, referring to the manner in which it is cooked. She used ground pork marinated in soy sauce and calamansi or lemon juice, mixed with chopped onion, with egg and bread crumbs as binder. And since we didn't have an oven when we were growing up, she would just steam the meatloaf, just like how she would do the embutido. Also, we didn't have loaf pan baking tins, she cooked them in llanera, or the oblong tins used for making leche flan. This was my mom's 30-minute dish when she needed something quick to serve for lunch or dinner. 1 Combine and mix all the ingredients except tomato sauce and cheese. 2 Put in a llañera or a loaf pan baking tin. 3 Pour tomato sauce over the top to fully cover. 4 Put grated cheese on top. 5 Steam for 30 minutes. 6 Serve with steamed white rice and enjoy!